A Little Wisdom for Growing Up is an ancient form of storytelling, of passing on wisdom between generations. In this delightful collection of fables from the natural world (in the style of Aesop's famous fables), the author seeks to pass on to his young son, Jonathan, what he has learned from life. Characters in these brief fables run the gamut---from skunks and fish, to trees and the human body. Each story has been carefully written to reflect the natural world in which children live, teaching them to be attentive to what is around them every day, but also to begin reflecting on what these mean.These stories are intended for children of all ages. Parents or teachers can use them to offer wisdom, whether at bedtime or before a nap, or whenever there is a need for a time out during the day. The stories may be read aloud first, before listeners offer their own morals and learnings from what they hear.Each story is told simply, in language children understand, but each fable illustrates a truth Morgan has gleaned from living. ""This 'quick read' embodies animal fables short enough for the youngest child's attention span on the one level, but [is] philosophical enough for the much older student and adult... . Every unit on fables and folklore should include this modern work... . I am grateful to have A Little Wisdom for Growing Up to add to a unit I teach on folk tales and fairy tales to second graders."" --Blinda Baxter, Mapleton Elementary School, Ashland County, Ohio""A Little Wisdom for Growing Up: From Father to Son by John C. Morgan is a book that I enthusiastically recommend. I read the book to my grandchildren and they also have given it their whole-hearted endorsement. This is a book that will aid parents, grandparents, teachers, and care-givers in their endeavor to teach children to be caring, thoughtful, and responsible."" --Elena H., Associated Content producer and author, http://www.associatedcontent.com/user/108710/elena_h.htmlJohn C. Morgan is a writer who also happens to teach college philosophy and ethics. He lives with his wife, son, three cats, and one dog--sources of support and learning for his stories. He has written many serious books before, but he believes he had the most fun writing this one. He thinks it just may be his best because it took him over sixty years to learn much at all and then to put what he had learned into so few words. The author holds two master's degrees and one doctorate in philosophy and ethics, but insists he learned mostly from staying awake and reflecting on life. 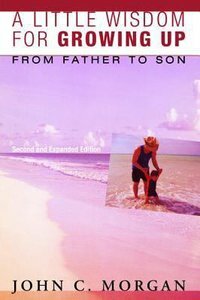 About "A Little Wisdom For Growing Up: From Father to Son (Expanded 2nd Edition)"